If you have been down to your local Mall lately, you may have noticed that mesh office chairs for big and tall people are few and far between. If you are lucky enough to test one out before buying then you definitely do have a advantage over a lot of other heavier folks. The thing is, most standard office chairs have a weight capacity of just 200 -225 lbs, so as a Big Man myself, I know how difficult it can be finding office chairs for heavy people. 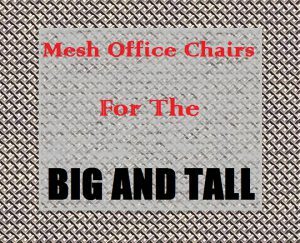 Like being Big and Tall is not hard enough, but trying to find the best mesh office chairs suitable to our needs is pretty much mission impossible. Should you give up your dream of owning a high weight capacity mesh office chair?. No Way!. Turn to the internet people, that’s where all the answers lay. Before we dive into some of my Office’s top rated mesh chairs suitable for tall people and overweight people, lets look at why mesh chairs are awesome. 1 Why You Shouldn’t Compromise On A Mesh Desk Chair? 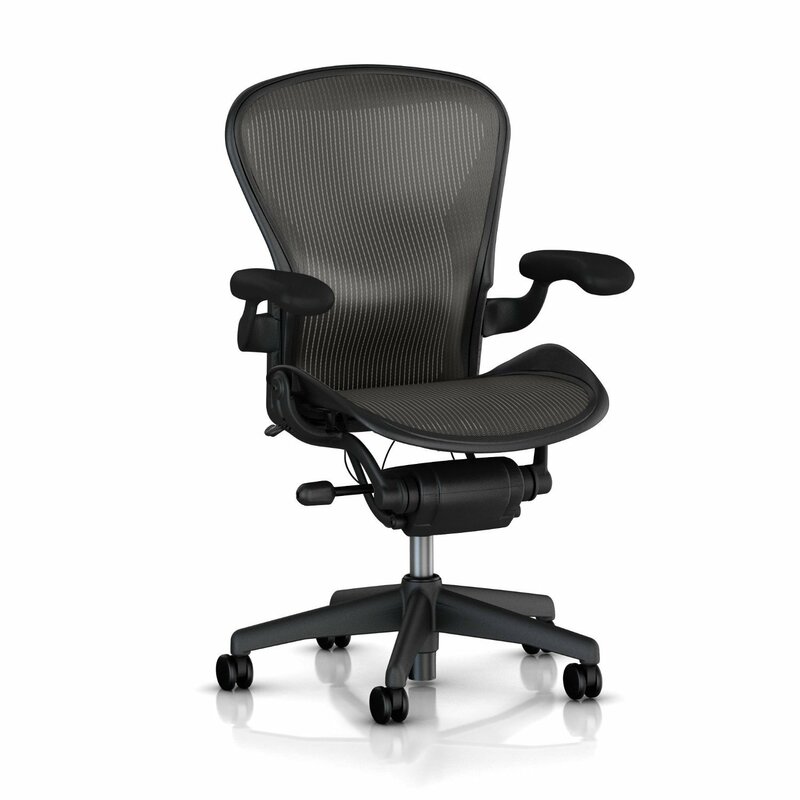 2 So What Is The Best Mesh Office Chair For Heavy People? Why You Shouldn’t Compromise On A Mesh Desk Chair? The mesh is breathable. So air flow is greatly increased due to the little holes in the mesh which results in a cooler working environment. There’s nothing worse than sweating even with the air con on. So I’ll do anything to reduce the embarrassing signs of typical ‘big Man’ sweat. Quality mesh materials are longer lasting from my experience. On many of my vinyl or leather office chairs over the years, the ares just under my knees tends to peel away and rip. With mesh, there is less chance of this occurring. So What Is The Best Mesh Office Chair For Heavy People? Some people may freak out when they see the price on amazon.com for the Herman Miller Aeron C Size, but it’s all for good reason. In my opinion the Herman Miller brand is the best of the best when it comes to high end office chairs. But whats even cooler about Herman Miller is the fact they cater to the plus size community. The ‘C’ Size of this model reflects the size of this chair is large. C being the largest of A, B , C sizes. Now this particular model is the ‘basic’ version and it has a weight capacity of 300 pounds. But Herman Miller do have other more advanced chairs, but for many folks paying upwards of $700 may be too much. With the basic you get fixed arms, which I’m use to anyways as I rest my arms on my desk when on the computer. There is also no headrest on the basic model, but the headrest can be purchased separately if you like. When you sit and work in this chair for 8 hours a day, you can easily compare it to a much more expensive chair (yes, office chairs do go over $1000+, typically genuine leather chairs), but you get the added bonus of this office chair being a very high quality mesh. Which is actually a certified Pellicle suspension mesh which drastically reduces heat from building up. Which I just love. The waterfall front lip of the chair is another high end feature which also assists in heat reduction and all round ergonomics. Having the waterfall edge assists in better blood flow by relieving pressure form your thighs. As for dimensions, the C size seat height can be adjusted between 15 -21 inches and is about 28 inches wide. Herman Miller have a recommended Height & Weight Chart to determine exactly if this chair is suitable for you. This is extremely helpful as not all folks are big and short, or big and tall. Available in a whole bunch of colors. 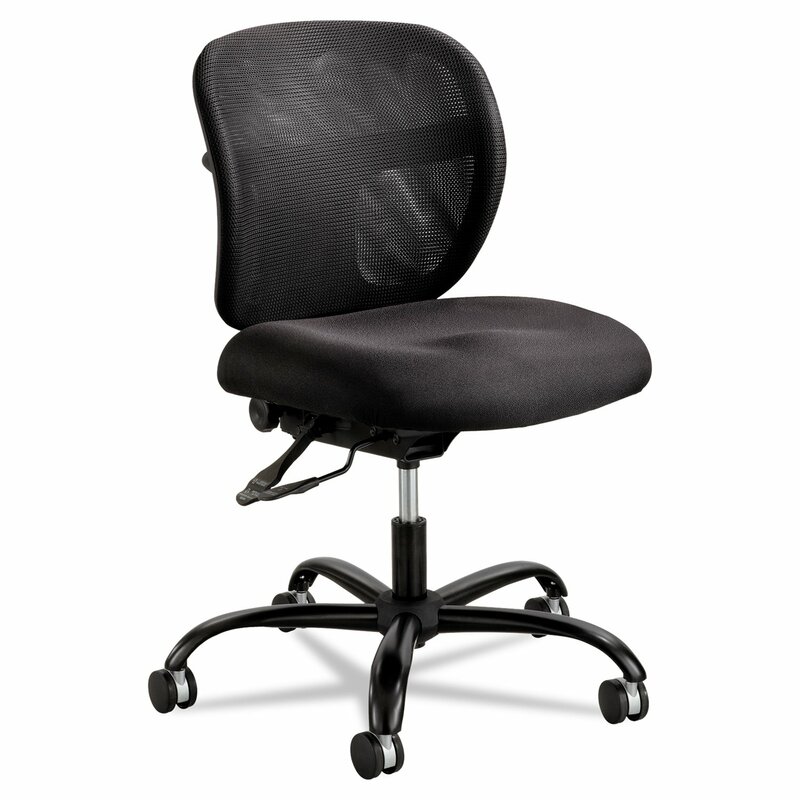 The Safco Vue task chair is a reinforced 500 lb weight capacity 24/7 office chair. Meaning it can handle the work load while also having the ability to take heavier weights compared to a standard 200 lbs capacity chair. Safco are not by any means new to the office chair game, so you know you are in safe hands with an established company. This particular model doesn’t have arms, however you can buy additional arms separately. But like I stated earlier, I’m not much of a fan for office chairs with arms. Arms can restrict oversized bodies from comfortably fitting in between the arms. However, the model for the arms you can adjust the height of the arms and the actual width. So for us bigger office workers, we can make the arms extend out wider than the actual chair. The actual back rest can be adjusted from 14″ to 17.5″ from seat height. Heavy duty 5 star base with 2.5″ dual carpet casters. Comes with tilt lock, and full 360 degree swivel feature. 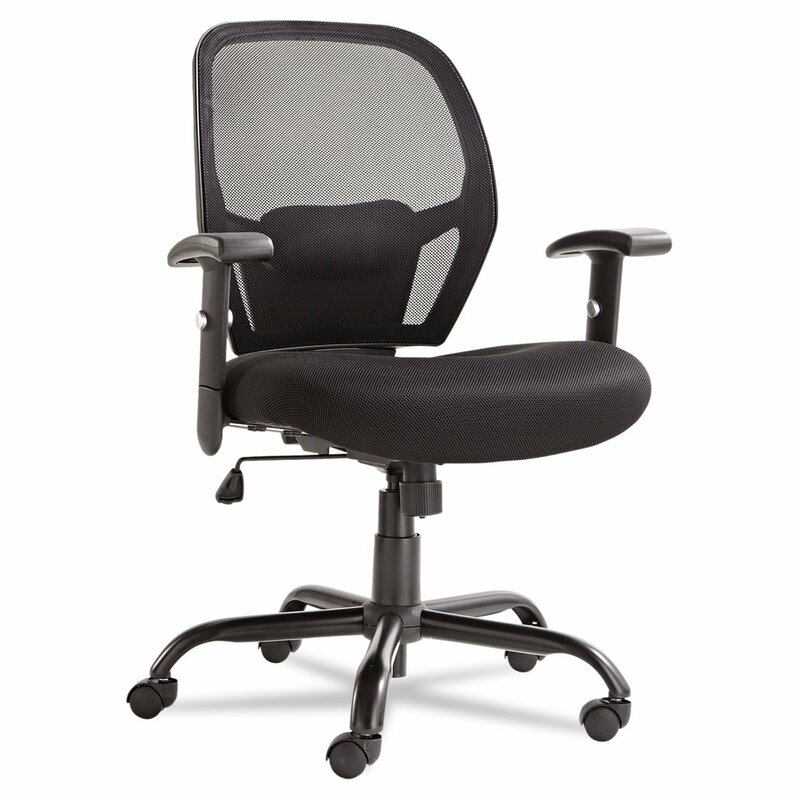 Another great choice high weight capacity mesh office chair suitable for the big and tall persons. The Alera Merix. This chair is a beast, it has a 450 lbs weight capacity and just looks all round tough. The Integral lumbar support is a nice touch as many of us office workers suffer lower back pain, especially overweight workers. It’s padded and mesh also which can be tightened or loosened to allow better control over comfort. This chair will suit both views on office chairs arms as these padded arms can be removed to please everyone. They also can move up and down. The open cell padded seat is a treat to sit in and can take a lot of abuse compared to a vinyl or leather chair in my opinion. This whole chair is just a dream for the larger sized person. Oversized and has the look of a really well made chair. The parts are heavy duty and has a a steel foundation to make any person up to 450 pounds feel safe. Here’s a few of the spec also found on the Alera website.